Carnage is a great study in human behavior with laughter for the prize. Bizarre and yet a tasty morsel, Carnage is one of those ‘fly on the wall' films where in this case you get to watch the decay of one's social skills and can laugh without them hearing you. It's four stellar actors in a room with a very wacky script and a tall order of ego, all moving in opposite directions over a simple solution. The simple stimulus concerns two boys who have a fight on a playground and report it to their parents, the Longstreet's Penelope (Jodie Foster) and Michael (John C. Reilly) versus the Cowen's Nancy (Kate Winslet) and Alan (Christoph Waltz). The Longstreet's invite the Cowen's over to discuss this act of aggression because a stick was used in the altercation that injured their son's face. When we pick up the story the Cowen's have already arrived and the couples are summing up a written report so they can agree on what had happened. After some nice pleasantries, a few phone calls received by Alan and idle chat the Cowen's decide to leave. Just as they get to the elevator Penelope invites them back into the apartment for some special homemade crumb cake and a drink. So starts an evening of unnecessary intervention that spirals into madness. I'm sure you have probably met couples like this and have gone though some very embarrassing situations where you upchucked on someone's table, got drunk, dropped a few F bombs, embarrassed yourself and your husband, yelled, screamed and then the most despicable thing – you smashed their tulips. Well if you haven't experienced this phenomenon it's time you did cause you need to see it coming before you accept the invitation to little Billy's friend's house for a quiet conversation about behavior. Director Roman Polanski (The Pianist) spools out his tale giving the audience just enough line to get hooked. Then he starts to unleash the mayhem, outrage, chaos and…oh yes carnage. His actors are perfectly cast for the roles with Foster coming on as the dotting housewife, Reilly a comical oaf, Winslet an understanding lady and Waltz an uncaring businessman. That is until the layers start to get pealed away and you see their real persona come through. Carnage is not exactly a Who's Afraid of Virginia Wolf (if you saw the film made back in the 1960's), but not too far off base. The two mirror each other in many ways with the drinking, arguments, embarrassment and more. 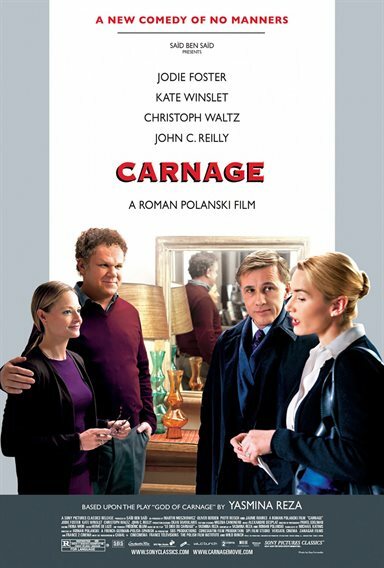 But with Carnage, Polanski doesn't push the envelope far enough to make his ‘audience fighting mad' leaving the theater with sights set on a possible chance at road rage. Polanski only goes far enough to the edge so as to laugh at his characters, not want to tear their eyes out, and that's a good thing. Carnage has been rated R by the MPAA for language. I does contain a lot of alcohol usage however, so be cautioned about that also before bringing youngsters in tow. Download Carnage from the iTunes Store in Digial HD. For more information about Carnage visit the FlickDirect Movie Database.